The group left Burley Idaho around 9:00AM, and we finally pulled into Moab around 2:00PM. Stopping at our houses for only about an hour, we quickly emptied the Jeeps and prepared for our first Moab trail: Fins N Things. After a quick air down and a drivers’ meeting at the base of Baby Lion’s Back, we were soon scaling up the incline that is a much tamer version of its’ feared (and closed down) parent not too far away. 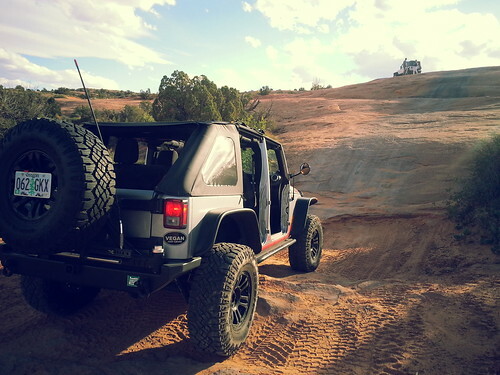 A quick air down for the Jeeps at the base of Baby Lion’s Back. 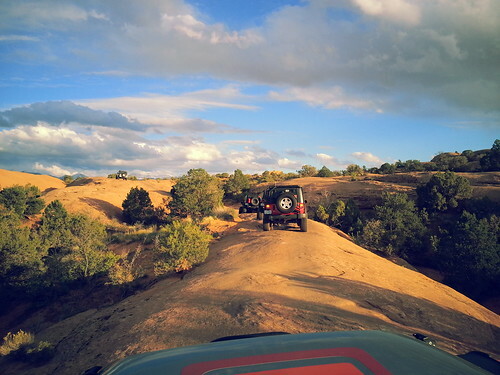 All the Jeeps scaled up the face of BLB and headed toward the steep descent on the other side. However, a pair of Jeeps that passed us warned of 6 foot deep water crossings and mud. After a quick inspection, it was decided to skip that and head back the way we came. Heading down Baby Lion’s Back. 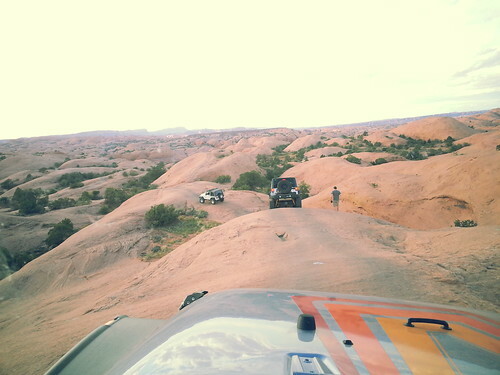 We decided to run the second section of Fins N’ Things to save a little time, as it was late and we had been in the Jeeps for over two days at this point. About to take Frank up a nice set of Ledges on Fins N’ Things. Fins N’ Things is named after the fins on the back of the Stegosaurus – one of my childhood favorites. This is due to the trail’s almost constant up and down motion. When coupled with the smooth, slick rock, you can see how the name fits. The light continued to get lower and lower as the shadows grew longer and longer. It was time to leave the trail and head back to the house for some much needed R&R. 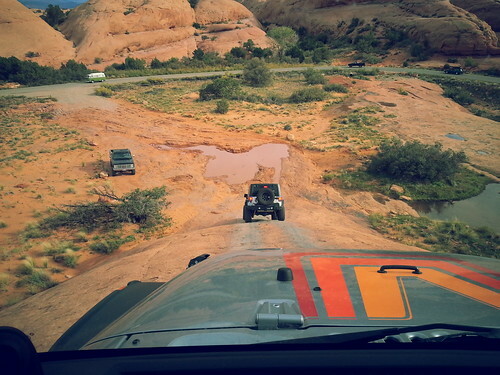 I highly recommend this trail for any Jeeper that goes to Moab. It was a perfect warm up and let us PNWers get a feel for the slickrock and also gave a taste of what is to come in the following days. I am pretty sure a stock rig would have no problems on Fins N’ Things. Heading back as the light continued to get lower.